When I'm on vacation (or an extended work trip), I'll typically prep at least one short post linking to some past content that still has relevance, and that newer readers of the blog might not have had the opportunity to enjoy the first time around. This week, I'll take a look back at my "Vintage Pen Primer" series, which offers my thoughts on the ins and outs of vintage pens. I've been thinking a lot about getting back into vintage to some degree, now that pen show season is in full swing, and the 2017 D.C. Pen Show is on the horizon. I'd like to find a "focus" for collecting, though, and not revert to the "little bit of everything" style I had assumed the last time I dabbled in vintage. Vacs, maybe? Waterman Man 100 Patrician in its original box. I have a soft spot in my heart for modern Waterman fountain pens, even though their line has become a bit stale since they were acquired by Newell-Rubbermaid in 2001, with fewer models introduced into the lineup. To me, the pens that Waterman manufactured during the 1980s and the 1990s are excellent--I think of them as "vintage" in the sense that they aren't available anymore, but "modern" in that they use contemporary Waterman cartridges and converters. The term I use to describe pens like these is "near modern," and they are a fixture in my collection. The name "Waterman" has a storied history in the fountain pen world, with the lore (repeated on the Company website) being that Lewis Edson Waterman invented the modern fountain pen. Others have recently cast doubt on this version of history, but the story still sticks. However, what many people don't know that the modern Waterman Pen Company is not the same company that made many of the classic Waterman pens from the 1930s and 1940s, but rather is a descendant of Jif-Waterman, the French subsidiary, which is now owned by Newell-Rubbermaid. Waterman has an interesting timeline on their website that shows various events from the history of the French and American companies, including all the major pen models introduced over the years. Of all these designs, the classic "Le Man 100" (known simply as the "Man 100" stateside), first introduced in 1982 for the company's 100th anniversary, is my favorite. The Waterman Man 100 is a large pen with a lot of heft, since the construction is lacquer over brass. The lacquer is very thick--despite the years and heavy use (from me), the finish is still flawless. The Waterman Man 100, at first glance, resembles a larger version of the Laureate and other more modern Waterman pens. It is solidly built using the typical Waterman lacquer-over-brass construction that gives the pen some weight. The style is classic Waterman, with the traditional "Waterman clip" the French company has used since the 1960s and the large 18k "Ideal" nib (borrowed, of course, from the early days of the Waterman "Ideal" fountain pen). The Man 100 was introduced in 1982 and intended to serve as Waterman's flagship luxury pen, competing with Montblanc and Pelikan. What makes this particular version unique, however, is the cap band. Note the stylized Waterman "W" logo on the finial and the cap band. Also, the cap is friction fit, with the back of the pen tapered to allow the pen to post firmly and securely. The band on this version of the Man 100 is modeled after the Waterman Patrician fountain pen from the 1920s and 1930s. Waterman manufactured these "Patrician" Man 100s as special editions from 1992 to 1994. If you shop around, they are starting to command what I consider to be extremely high prices. I'm glad I bought when I did: I love my two Man 100 Patricians, but I'm not sure that I'd be willing to pay what people are asking these days. One thing I will say--if you can find these new-old-stock, the packaging on these older pens is gorgeous. It comes with a nice wooden box. The faux-leather on the inside is a bit worn, but hey, it's almost 25 years old. The Waterman Man 100 Ideal Nib. Now for the writing experience: Waterman nibs are on the stiff side. The stainless and gold-plated nibs are definitely nails, but the 18k gold nibs have the tiniest bit of spring to them--just enough to keep the writing interesting. I have two of these pens: a coral ("Cardinal Red") and a green. Both of my pens have fine nibs and wrote adequately out of the box. My coral pen was N.O.S., so the fine nib wrote like a dream. My green pen was used, and the nib was slightly worn in (to someone else's writing style), so I had Mike Masuyama tweak it. No big deal. Both are now very nice daily workhorses. I use my Waterman pens a fair bit, but I haven't written much about them, probably because I'm just as liable as the next person to get caught up in the latest "craze" to the detriment of my workhorse pens. A while back I did write a piece for Maybelline over at her blog On Fountain Pens discussing my first "nice" pen, the Waterman Laureate. As I mentioned, the Patrician models of the Man 100 pens are becoming difficult to find. Occasionally, they come up on Gary Lehrer's GoPens newsletter, which is where I purchased mine. I'm still looking to acquire the blue version to complete my collection. If anyone has one they are looking to unload, please reach out! Waterman pens from the Company's current lineup can be purchased from our sponsors Pen Boutique and Pen Chalet. Waterman also sells a lot through larger retail channels like Staples and Amazon. You can occasionally find Waterman pens in big-box office supply stores, if they still have a "fine writing" section. The pens featured in this review were purchased with my own funds for my own collection. I was not compensated for this review. DISCLAIMER: This post contains affiliate links, through which I may be compensated a small amount if you purchase a pen from certain sites linked to in this article. While I'd greatly appreciate it if you use these links to purchase something you are interested in, you are, of course, under no obligation to do so. Many thanks! The vintage pen "gold standard." While I'm working on the more comprehensive Parker Vacumatic review, I thought I would write a shorter piece to specifically answer some questions I've received about inks that are safe to use in vintage pens. Experienced pen repairers and restorers typically advise vintage pen collectors to use what they deem to be "safe" inks in vintage pens, namely Waterman Ink and Sheaffer Skrip. You also hear Aurora being plugged from time to time. So what's the truth here? First of all, a disclaimer: everything I say on this website comes from my own experience, which is limited compared to many, many others out there, given that I have only been collecting for five or six years. For example, Richard Binder has written an excellent (and comprehensive) article on fountain pen inks, which has not only informed my own views but, at least to me, remains the definitive authority out there on this issue. Clean your pens regularly! 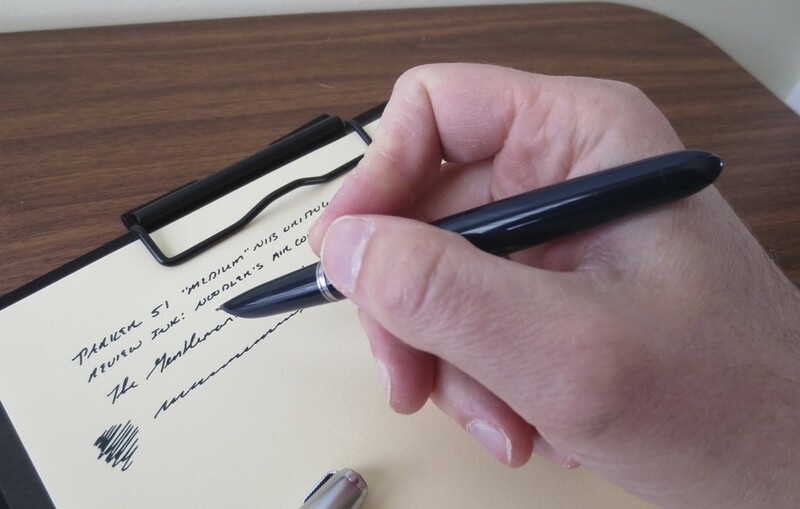 No matter what ink you may use, you need to practice good pen hygiene and make sure your pens are flushed regularly. This is especially true with vintage pens, which were designed to write with more "watery" inks and can clog easier than their modern counterparts. If you must use highly saturated inks such as Noodler's, Private Reserve, or Levenger in a vintage pen, clean regularly and be prepared to see some staining. For example, I've accepted that the clear ink sac in my user-grade Parker 51 is never going to return to its original color after I filled it with Noodler's La Couleur Royale, but I don't care. It's not a collector's item, and I practice good pen hygiene when using Noodler's Inks in that pen (i.e., flushing the pen after every fill). Avoid purple inks in vintage pens. I've found that even Waterman purple has a tendency to stain. Don't use certain vintage inks such as Parker 51 Ink or Superchrome. You can still find bottles of these inks in antique stores, and apparently people are tempted to use them. While certain vintage inks such as Carter's Ink and Sheaffer Skrip have held up well over the years and are perfectly usable, 51 Ink and Superchrome are highly corrosive and will destroy pens. If any vintage ink you might find--no matter the brand--has mold or a musty smell, don't use it. Finally, if you feel handicapped by the colors available to you in the "safe" ink lines, consider ink mixing! I created the red-black ink below using a mixture of four parts Sheaffer Skrip and one part Aurora Black. I've been very satisfied with the result. Mixing Waterman blue and Waterman purple 50/50 will also create a nice violet-blue color, which stains less than pure purple, in my experience. My first "creation": "The Gentleman Stationer Red-Black". My Midnight Blue Aerometric Parker 51, loaded with Noodler's Air Corps Blue Black. When it comes to vintage pens, few pens evoke the same degree of emotion as the Parker 51. The Parker 51 is iconic: it dominated the fountain pen market for many years in the middle of the 20th century. But as with many pens that are not “traditional” looking, you either hate this pen or you love this pen. There’s not really a middle ground. Personally, I love the Parker 51. It was the first vintage pen that I owned, and is probably my second favorite vintage pen behind the Parker Vacumatic. The Parker 51 in hand to give you an indication of the size. Vintage and (very) modern, side by side. this picture gives you another sense of the size compared to the Lamy AL-Star. The 51 was first conceived in the late 1930s and appeared on the market in 1941, following the Vacumatic in Parker's product life cycle. For the first several years of the pen’s existence, it actually used the Vacumatic’s filling system, which involved using a pump to fill the body of the pen with ink. Vacumatic 51s are still readily available, have a large ink capacity, and generally work well, although they tend to require a bit more restoration work and can be frustrating to clean when changing inks. Vacumatic fillers are not as durable as the later aerometric models, which were introduced in the late 1940’s, and require periodic servicing to replace the sac. Aerometric fillers can also fail, but the sacs Parker used in those hold up well over time. I have a few 51s in my personal collection. 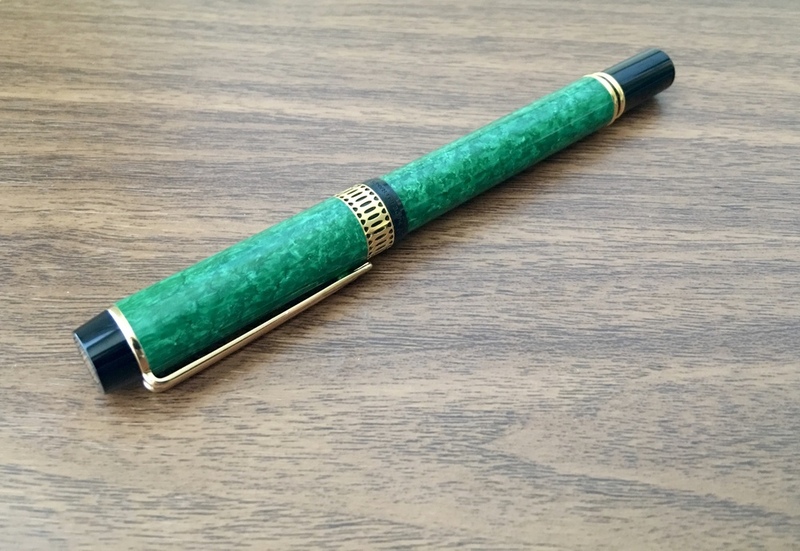 My “user” pen, the one that I consider “my 51,” is the first vintage pen I purchased at the 2011 Ohio Pen Show. It’s a Midnight Blue Aerometric filler, and it has a smooth medium nib. True medium nibs on Parker 51s are somewhat hard to find. Most of these pens shipped with fine and extra fine nibs; broad and stub nibs command a premium in today’s vintage pen market. This 51 is definitely a “user grade” pen. In vintage pen parlance, that means the pen is not a mint-condition collector’s piece. 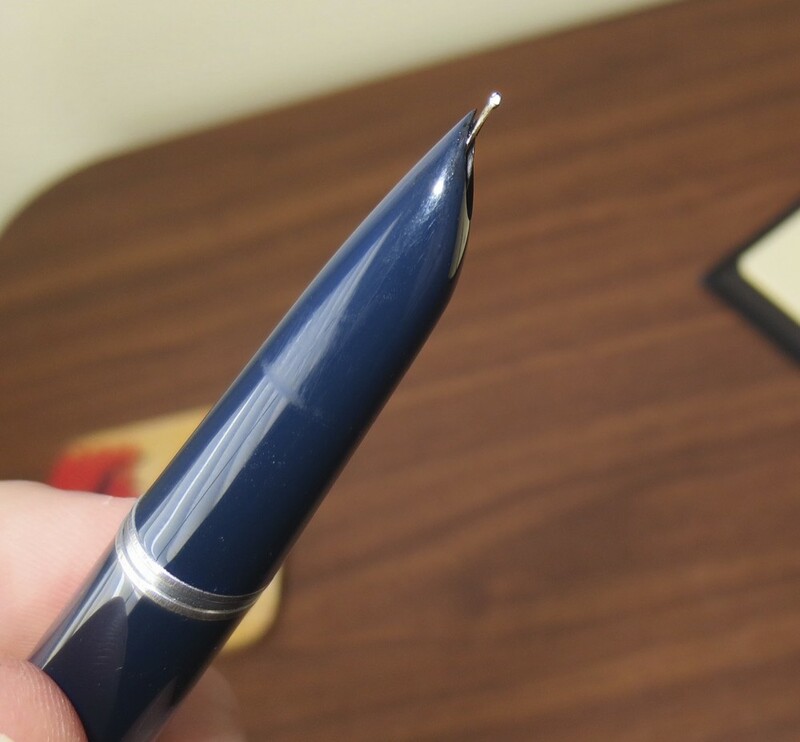 There are micro-scratches on the barrel from where the pen has been capped and posted numerous times during its life, and there is some pitting on the chrome cap. In short, this pen has been used in the past, and I will continue to use it. The looks of this pen didn’t matter to me so much: I bought it for the nib. As I mentioned in my last post regarding getting into the vintage pen game, I prefer to buy user-grade pens. This way, I can carry the pen to and from work, use the pen, and not have to worry about whether the particular ink I want to use is “safe” for vintage pens. If you are buying an older Parker 51 that uses the vacumatic filling system, make sure that it works, or that the price you pay accounts for the cost of having the filling system restored by a competent restorer. It's unlikely the filling system will work without servicing. If you’re moderately handy, you can restore the pen yourself, but properly disassembling the pen and fixing the filler unit requires some supplies and typically, some special tools. If you’re not careful, you can break the pen beyond repair. Last time I checked, the going rate for repair of a vacumatic filler was $25–50, depending on the extent of the necessary restoration and assuming that the filler unit has to be repaired and not replaced. The Parker 51 is a rounded pen that is very smooth and can be slippery. 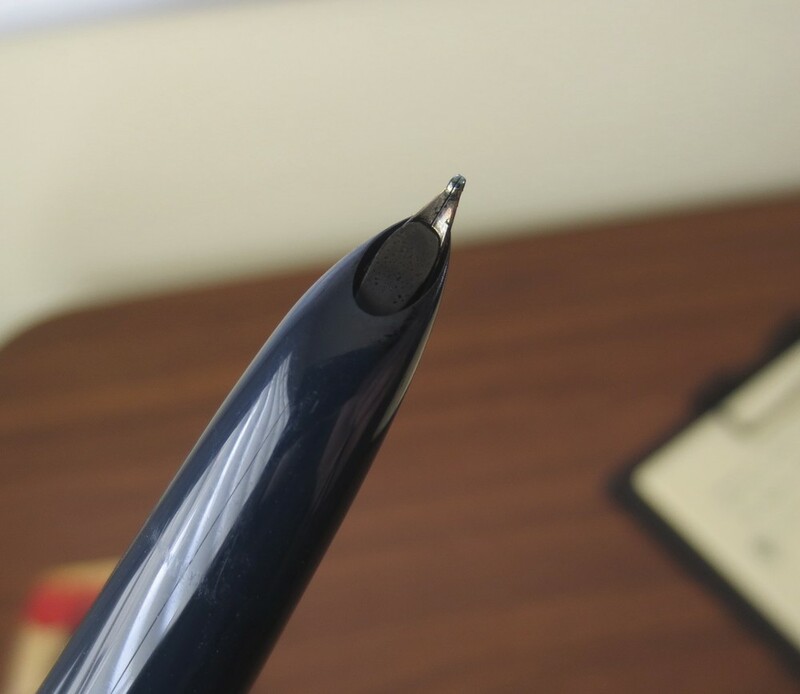 Some people find the pen difficult to grip, which in turn causes the pen to skip or scratch because the nib does not stay properly oriented on the paper. This issue is not something that I have personally noticed, but I see the complaint from time to time. Watch the prices on these pens. I have seen lots of overpriced Parker 51s, both at pen shows and on eBay. At the show where I bought my pen, the going rate for a user-grade aerometric Parker 51, in respectable condition with a decent nib, was around $100. Prices of course, may vary, and if you are willing to take a little risk on eBay, you can get them for much less (especially if you buy wholesale lots of unrestored pens). Overall, the Parker 51 is a great “first vintage pen,” if you are willing to spend a little money to get one in decent condition. The pen is iconic, if you like it’s “futuristic design,” and it’s a durable workhorse. I’ve found 51s in eBay lots that need little restoration other than a flush with water and pen cleaner. Next in this series will be my favorite vintage pen, and the centerpiece of my personal collection, the Parker Vacumatic. Note: I purchased my Parker 51 from Tom Mullane, who passed away last year. Most of the background information in this article comes from discussions I have had with dealers and collectors at pen shows, as well as Andreas Lambrou's authoritative Fountain Pens of the World. If you are considering collecting vintage pens, invest in this book. It's expensive, but will save you money in the long run. I don't regret the purchase, because if it saves you money on one or two bad pens it's paid for itself.